Publish date: 17. May 2018. In 2015/2016 the Republic of Croatia joined “Childhood Obesity Surveillance Initiative (COSI)” and conducted a research together with 37 participating countries. In Croatia, the research launched in 2006 by the European Office of the World Health Organization and 13 member states, was carried out by the Croatian Institute of Public Health, supported by the Ministry of Health and Ministry of Science and Education of the Republic of Croatia. Obesity has been globally accepted as an important variable health risk for the development of chronic noncommunicable diseases (CND). According to the European strategy for the prevention and control of chronic noncommunicable diseases, seven risks to the development of today’s leading chronic noncommunicable diseases have been identified. Of all the known risks, only overweight and obesity are a significant risk to the development of all five leading CNDs. Preventing the development of overweight and obesity from the earliest age through promoting healthy habits and ensuring environmental support also prevents CNDs. Europska inicijativa praćenja debljine u djece, Hrvatska 2015./2016. in Croatian. 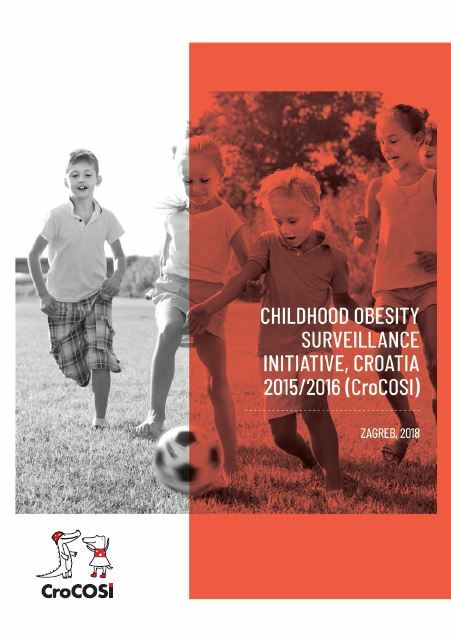 Childhood Obesity Surveillance Initiative, Croatia 2015/2016 (CroCOSI) in English. Recommend it to friends and colleagues!